Back in the day my friend Jen and I haunted this place called The Turf…now framed in history as the mecca of early Midwestern skateboarding. All I knew then was that instead of being one of the girls gripping the chain link fence from the outside, I wanted to be on the inside where the boys were, ripping lines through the Cloverleaf bowl at a frenetic pace. My mind blown by loud grinds and high hip airs. At best I cheered them on while jukebox favorites like Iron Man blared through the speakers or I played pinball…Earthshaker! Afterward we’d all pile in the car 8 or 9 deep, head to The Cliffs and create chaos around the bonfire. Oh the days of youth. Luckily I was able to realize the lasting inspiration from being exposed to this unbelievably talented crew, who shredded with fury, marched to the beat of their own drum and looked at the world differently than all other ho-dunks around us in that town. They just had this unique vision of how life could be. I was definitely on the same train. Ultimately I harnessed this inspiring energy and vision into snowboarding, where I was able to shred mountain ranges around the world, and in the process brought it full circle by learning to skate a few years later. Now if only I could skate that Cloverleaf once damnit…Save the Turf! Deep love and respect for these roots and the Mil-town hesh crew: Sam Hitz (lil’ Sammy Slasher), Al Partanen, Jay Iding, Rob Owen, Pete Burnside (Robot), Shawn Keeling, Charlie Brown, Christian Brox and The Beaudoin Brothers (RIP Zill) among others. 20 years later and these boys are still making miracles happen. 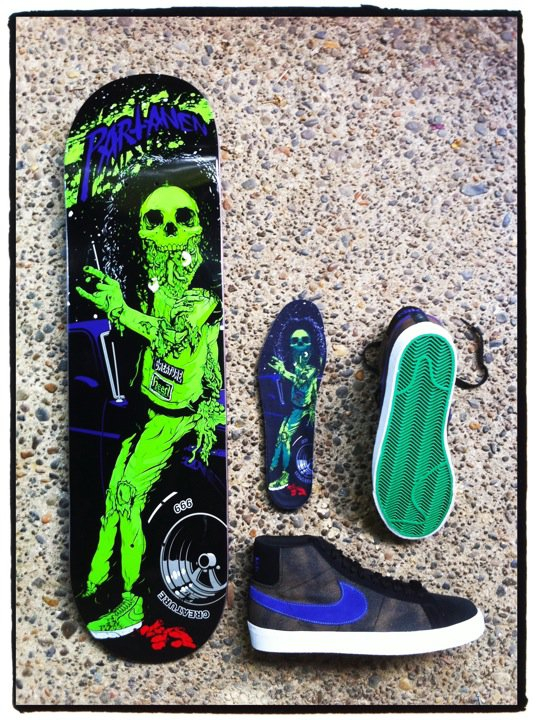 Peep Al’s new Creature board and Nike SB signature shoe combo. So ill. BELIEVE IT!